I’m obsessed with a good lipstick and I thought I’d share my current top five! 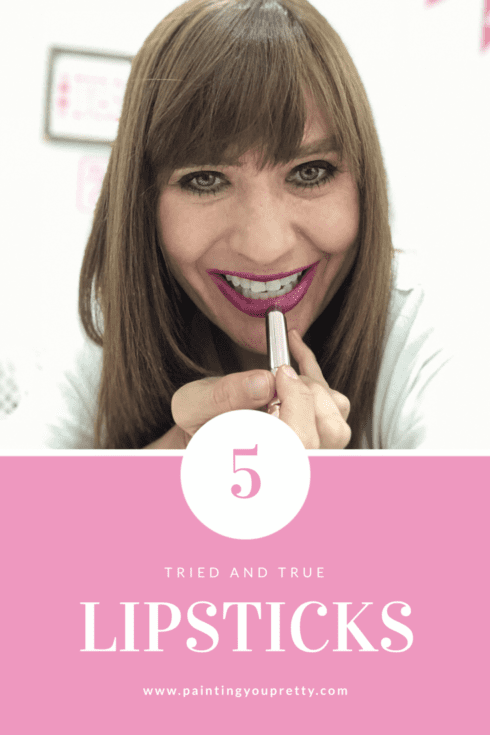 I use them for a variety of different reasons, because I am a firm believer that a girl can NEVER have too many good lipsticks! This lipstick feels amazing! I use the dark magenta color and lightly dab it on my lips for a stain like look and some moisture when I want a no-makeup look. For a long wearing inexpensive lip color, try Rimmel’s liquid lipstick. These remind me a lot of the Kat Von D liquid lipsticks, but they are much more affordable. The lipstick lover in me wants this in my makeup hall of fame, but I’m keeping it on hand for those days when I want to pull out a different shade of lipstick or just because I think it is so darn cute! It’s hard to stray from a favorite. I’ve been wearing this for years, and I love the pigment, texture, and longevity of this product. Plus, they make my favorite shade of pink – Fiore! I use this consistently on people who want something a little more than a gloss, but not too lipstick looking. It’s affordable and it feels good on the lips.